Choosing the Cloud is more difficult now as vendors regularly drop prices and offer new features. I’m sure there is no clear winner and each will have each own strength and weakness. So, it is better to set the context before we compare. Team is small but all are seasoned developer. Going to release multiple times per day. At least two environments. Dev, Production. At least need to develop one web application and one mobile app. PaaS is always preferred than IaaS. Only AWS, Azure or Google. Main development platform will be either .Net Core or Golang. 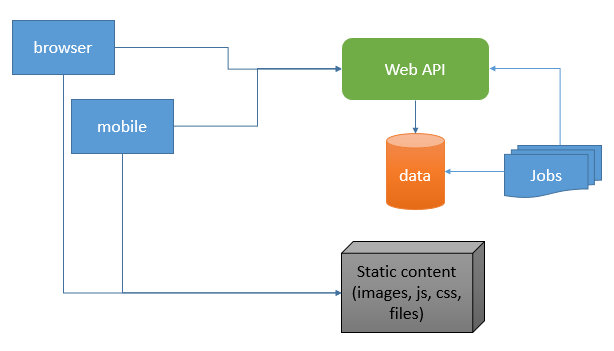 This is very typical architecture for public facing web application. Of course, it could be split into many micro services - it would be multiple API services calling each other.I think this diagram is good enought for the very high level architecture. The following table describes the components and related cloud features. Managed services mean server is maintained by provider. The higher number, the better. I gave Azure WebSites to 4 because it doesn’t have other features compare to AppEngine such as version splitting, no downtime deployment, no free centralize cache (memcache/redis), etc. AppEngine: (1x free quota, 1x n1-standard-1 flex-vm) assuming that we got more traffic than what free quota provides. Azure: (1x B, 1x S2) it is very difficult to convert DTU to server. So, I just guess it from this review. For our usecase, there won’t be many jobs running and we could re-use resource from Web such as WebJobs or AppEngine tasks. So, I’ll skip the comparison. 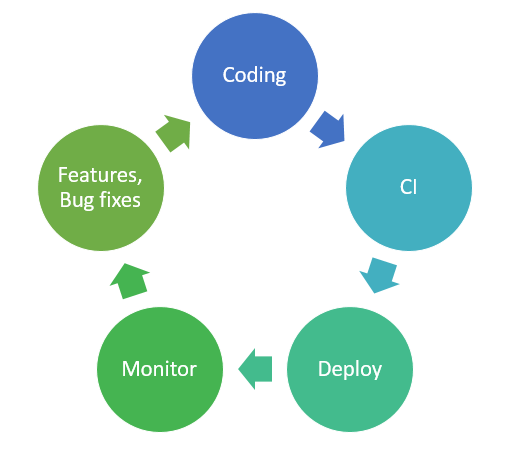 We could use CircleCI (1 concurrent build is free) for AWS and Google while we use Visual Studio Team Services for Azure. So, I’ll also skip it. I will try to break down into a few software development processes so that we can compare each process for different cloud providers. Yes. This is SDLC for our team. We are targeting to release multiple times per day. Small, fast and incremental releases. The following table contains some components which hasn’t covered by the basic architecture components. Both Go and dotnet core are great. It is all up to your team. Even if your team know about dotnet, the new dotnet is completely new. You have to re-learn a lot. I warn you. Visual Studio Team services included everything from CI to deployment and it is well integrate with Azure. I think it has some edge over other providers. There are only two contenders, Azure and Google Cloud Platform. I didn’t have good experience with Application Insights - to be fair it is still in preview. No API (to read data) yet. Container has been very porpular in recent years and many company bet on that as future software packing. Even Microsoft partner with Docker to bring Docker to Windows (Nano Server). It won’t be too long for Microsoft own Container Service will land to Azure. Anyway, for now - there is only two horses (AWS and GCP) in this race. I personally haven’t tried but both of them are just sit on top of VMs. If comparing VMs, Google Cloud Platform has some edge on that and their container engine is K8 is opensource - that will bring portability if you need to host in on-premise servers. You may notice that Azure is a bit more expensive than others but they have nice BizSpark program. With that, you will get $150/month credit for 3 years. That will help you to run without spending money for 3 years but after that you still need to pay. If you have reach this far, I believe you notice that I’m a bit toward Google Cloud Platform because of their pricing model (Per-Minute Billing and Automatic Discounts) and their PaaS offering such as AppEngine, StackDriver and Container Engine. But. You will never wrong for choosing one because each has their own strength. The real pros and cons is depends on YOU. (Your Team, Skillset, Business deal/startup accelerator, etc.). The best way to choose is draw your architecture and do some research on that with all three providers. I re-setup jekyll on my PC as I didn’t upgrade since I did it 3 years ago. It is much easier to setup jekyll on windows - thanks to bundler and github-pages gem. source 'https://rubygems.org' gem 'github-pages' gem 'wdm', '>= 0.1.0' if Gem.win_platform? Use the command bundle exec jekyll serve in the root of repository and the site should be available at http://localhost:4000. But after you enable 2FA, the above method doesn’t work anymore. We need a few more steps to make https url work with 2FA. That’s all, you should now be able to push without entering any username and password. I was playing with squid to set up as forward proxy. If you are not sure about proxy, there a great answer at stackoverflow. In this post, I will use Azure as Cloud platform, but it should also work on Amazon as well. 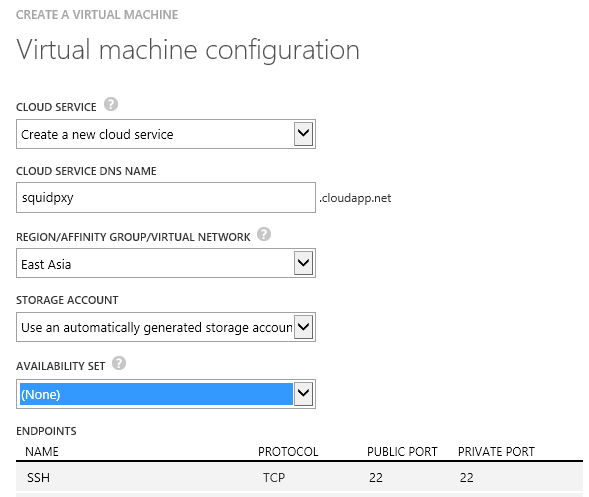 We will first create a linux VM using Azure portal and later we use PuTTy to access. 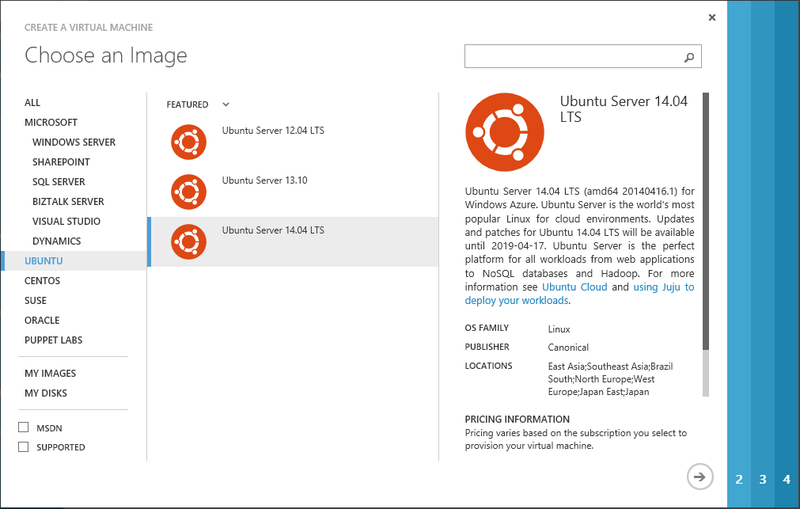 From azure portal, I’ll go NEW | COMPUTE | VIRTUAL MACHINE | FROM GALLERY and choose Ubuntu. I will just choose user name with password. If you prefer SSH key, you can also use that too. I’ll create new CLOUD SERVICE as well - if you are wondering what cloud service is, it is just the container of one or more virtual machines. Please note that there is CLOUD SERVICE DNS NAME - we will use that name to connect the vm. Now, I’ll use PuTTy to connect the vm (We just need Putty.exe). The host name will be cloud-service-name.cloudapp.net - in my case, the host name is squidpxy.cloudapp.net. 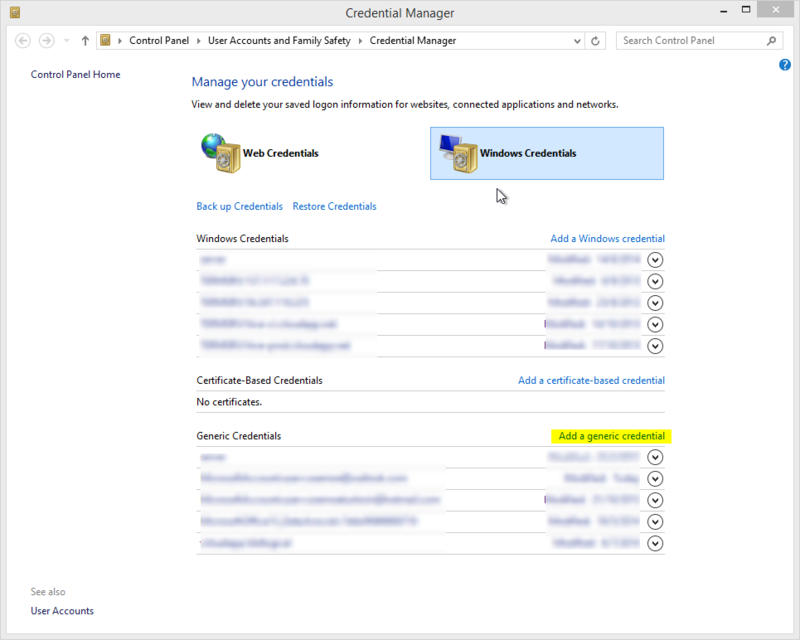 After connect, you should be able to log in with user name and password. Before install anything, we will update the system itself first. We will install Squid and some utilities that we need later. We are going to use HTTP Digest authentication to authenticate users using a local password file. Let’s create the password file. you should see this - of course, the date and time will be different. Now, we are going to add user to password file by using htdigest from apache2-utils. It is the time to configure squid. The default configuration file is in /etc/squid3/squid.conf with thousands of line - because it is heavily documented configuration file. I think it is better to create new file than editing the default config. I will just use squid default port: 3128, but I strongly recommend to change other random port. After we configure, we need restart the squid with this command. 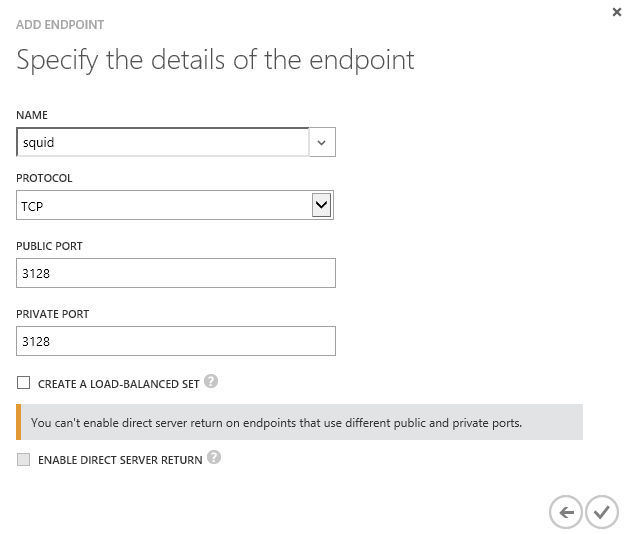 For now, we will just use standalone endpoint and specify the endpoint details with the port squid use. OK. That’s all to install and configure squid. When the browser prompt the dialog box, enter user name and password. You should be able to browse via proxy now. You could test your IP at http://whatismyipaddress.com/. 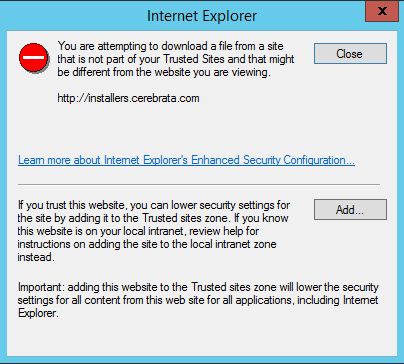 It should be different if you test your IP with different browser. 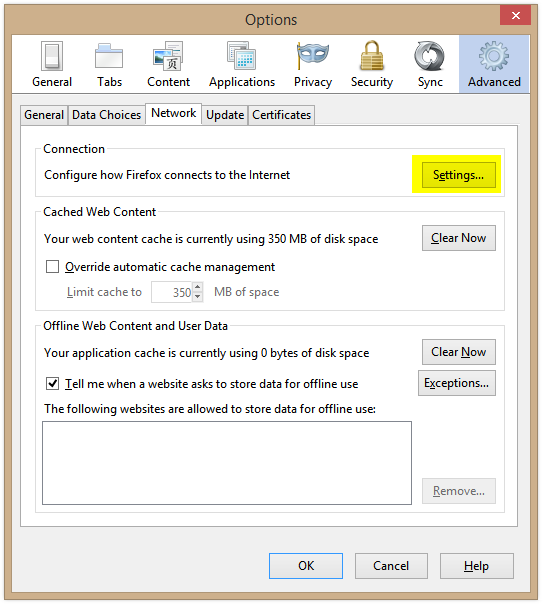 It is because the server still can detect that you are browser via proxy. 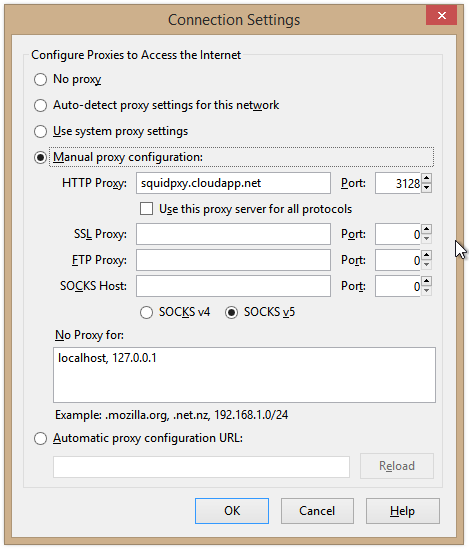 To protect the privacy, we can strip proxy header by adding the following settings to squid.conf. We restart squid to reload the config. 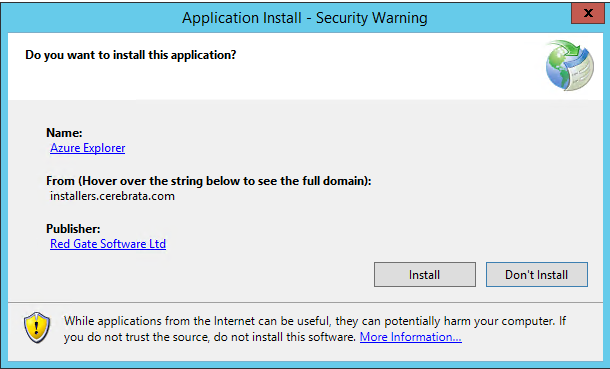 Now, if you visit http://www.whatismyip.com/, the server should not able to detect you are behind the proxy. 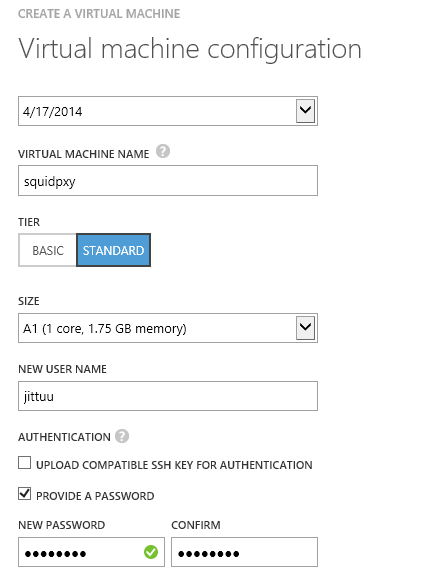 I hope this post will help someone who want to set up squid as forward proxy in azure. 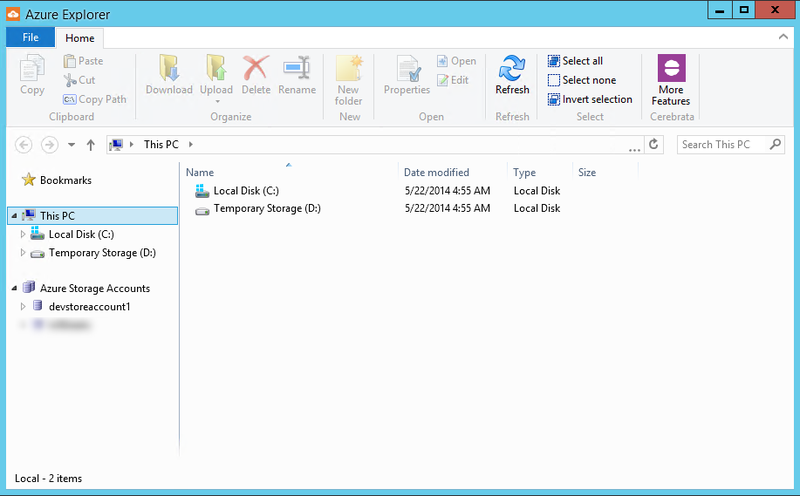 I use Azure Explorer from cerebrata to work with azure storage. 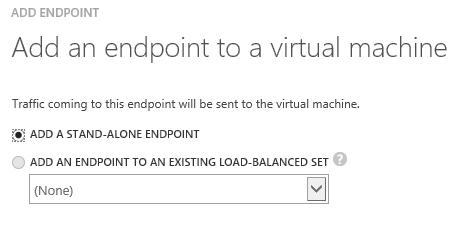 Today, I need to use it at my azure VM with Windows Server 2012. I opened IE and go to download Azure Explorer - then I got this error. When the installation finish, …. it works!